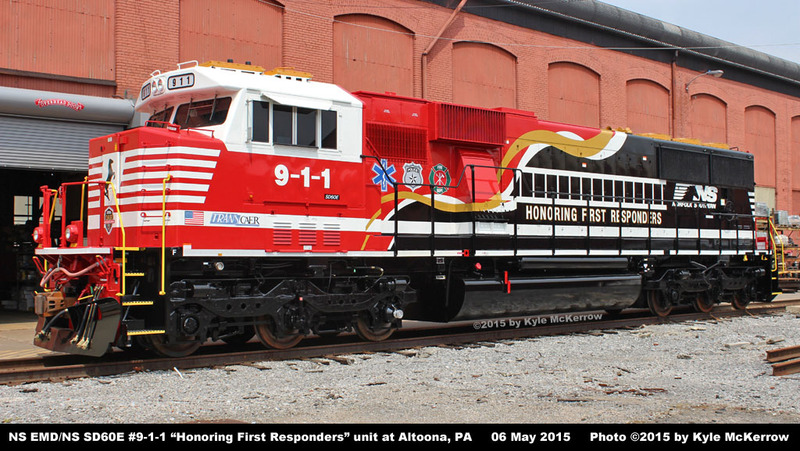 911 -- NS EMD SD60 6577 07-1985 847023 847023-14 05-2015 NS 3,900 Painted in special red, white, gold, and black scheme "Honoring First Responders". 6920 -- NS EMD SD60 6515/HLCX 5978/CRIX 5978/UP 5978/CNW 8014 08-1986 867147 867147-14 11-2012 NS 4,000 Painted in special red, white, blue, and black scheme "Honoring Our Veterans". 6921 -- NS EMD SD60 6689 12-1990 897056 897056-14 01-2014 NS 4,000 Unit is 2nd 6921 - see note at bottom of page. 6922 -- NS EMD SD60 6540/HLCX 5991/UP 5991/CNW 8039 09-1986 867147 867147-39 02-2014 NS 4,000 Unit is 2nd 6922 - see note at bottom of page. 6923 -- NS EMD SD60 6528/HLCX 5999/UP 5999/CNW 8050 09-1986 867147 867147-50 02-2014 NS 4,000 Unit is 2nd 6923 - see note at bottom of page. 6924 -- NS EMD SD60 6518/HLCX 5956/CRIX 5956/UP 5956/CNW 8022 08-1986 867147 867147-22 09-2013 NS 4,000 Unit is 2nd 6924 - see note at bottom of page. 6925 -- NS EMD SD60 6511/HLCX 5971/CRIX 5971/UP 5971/CNW 8002 08-1986 867147 867147-2 11-2013 NS 4,000 Unit is 2nd 6925 - see note at bottom of page. 6926 -- NS EMD SD60 6513/HLCX 5976/CRIX 5976/UP 5976/CNW 8012 08-1986 867147 867147-12 08-2013 NS 4,000 Unit is 2nd 6926 - see note at bottom of page. 6927 -- NS EMD SD60 6527/HLCX 5994/UP 5994/CNW 8042 09-1986 867147 867147-42 11-2013 NS 4,000 Unit is 2nd 6927 - see note at bottom of page. 6946 6921:1 NS EMD SD60 6539/HLCX 5963/UP 5963/CNW 8037 09-1986 867147 867147-37 03-2013 NS 4,000 Renumbered 04-2013 from NS 6921:1. 6947 6922:1 NS EMD SD60 6537/HLCX 5985/CRIX 5985/UP 5985/CNW 8027 08-1986 867147 867147-27 03-2013 NS 4,000 Renumbered 05-2013 from NS 6922:1. 6948 6923:1 NS EMD SD60 6535/HLCX 5954/CRIX 5954/UP 5954/CNW 8018 08-1986 867147 867147-18 03-2013 NS 4,000 Renumbered 04-2013 from NS 6923:1. 6949 6924:1 HLCX EMD SD60 5945/UP 5945/CNW 8055 10-1986 867147 867147-55 05-2013 NS 4,000 Renumbered 05-2013 from NS 6924:1. 6950 6925:1 HLCX EMD SD60 5990/UP 5990/CNW 8038 09-1986 867147 867147-38 03-2013 NS 4,000 Renumbered 05-2013 from NS 6925:1. 6951 6926:1 NS EMD SD60 6525/HLCX 5986/CRIX 5986/UP 5986/CNW 8032 09-1986 867147 867147-32 09-2013 NS 4,000 Renumbered 05-2013 from NS 6926:1. 6952 6927:1 NS EMD SD60 6529/HLCX 5967/CNW 8052 09-1986 867147 867147-52 01-2014 NS 4,000 Renumbered 05-2013 from NS 6927:1. 6963 -- NS EMD SD60 6531/HLCX 5972/CRIX 5972/UP 5972/CNW 8004 08-1986 867147 867147-4 03-2014 NS 4,500 Painted in special "GORAIL" paint scheme. 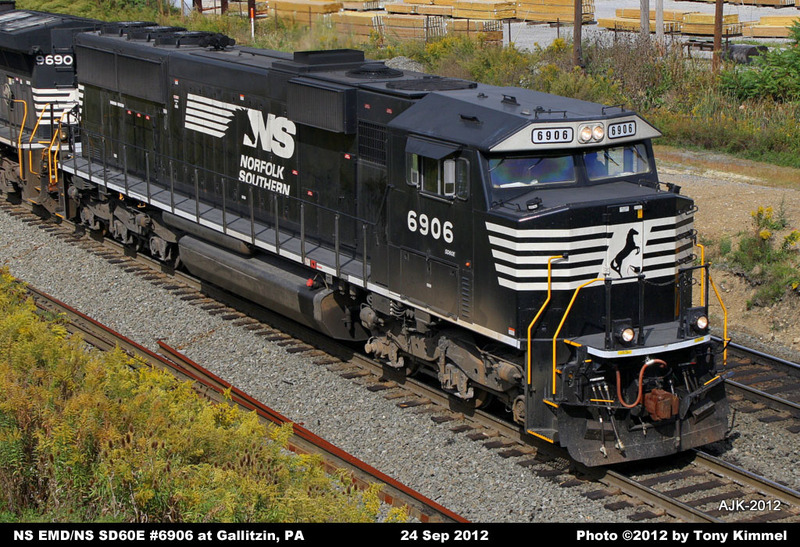 6966 -- NS EMD SD60 6646 08-1986 857125 857125-6 04-2014 NS 3,900 Unit currently stored, but still on the active roster. 7000 -- NS EMD SD60 6542/HLCX 5993/UP 5993/CNW 8041 09-1986 867147 867147-41 04-2015 NS 4,500 Unit currently stored, but still on the active roster. 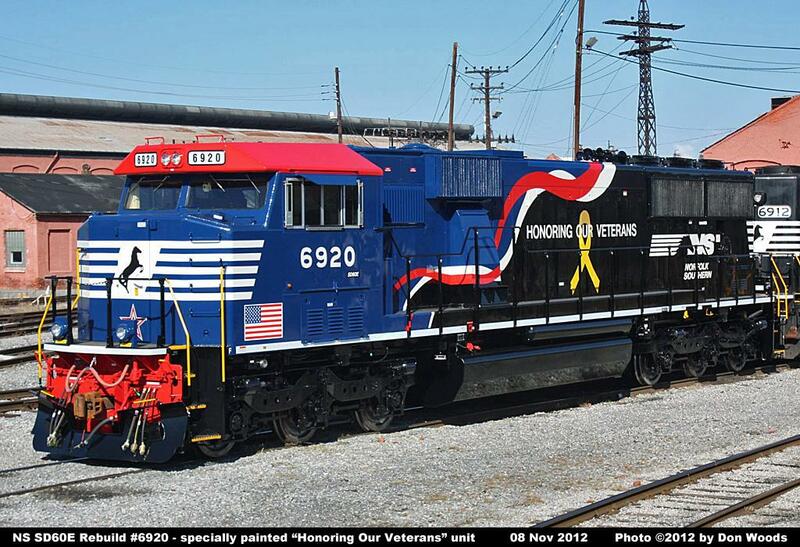 Before completion, the unit being rebuilt as 7003 was selected to become NS 911, the "Honoring First Responders" unit. 7005 -- NS EMD SD60 6547/HLCX 5966/UP 5966/CNW 8049 09-1986 867147 867147-49 06-2015 NS 4,500 Unit currently stored, but still on the active roster. 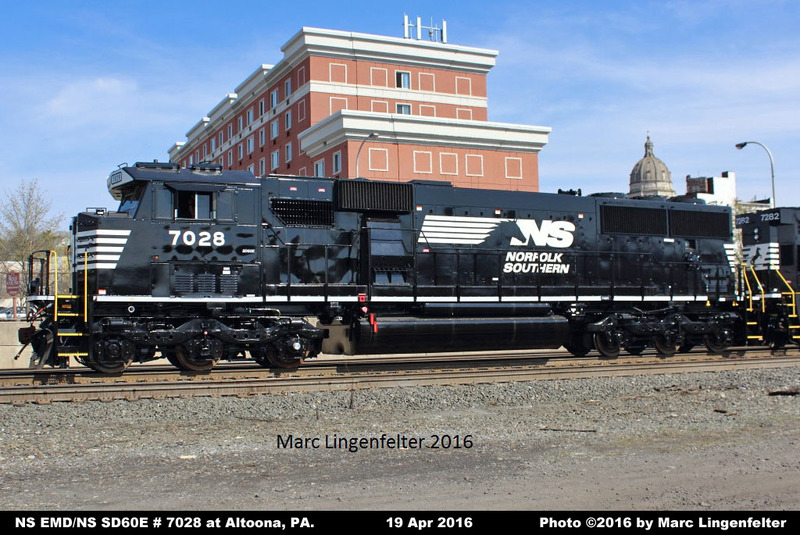 7011 -- NS EMD SD60 6622 02-1986 857107 857107-19 07-2015 NS 3,900 Unit currently stored, but still on the active roster. 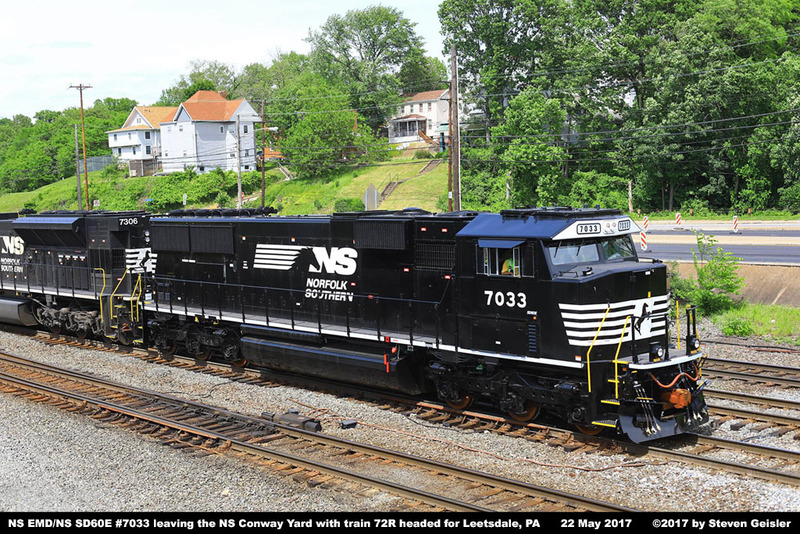 7026 -- NS EMD SD60 6633 06-1986 857124 857124-5 03-2016 NS 3,900 Unit currently stored, but still on the active roster. Powered by an EMD 16-cylinder 710G3B-IC engine. Units are upgraded to meet Tier 0+ emissions standards. 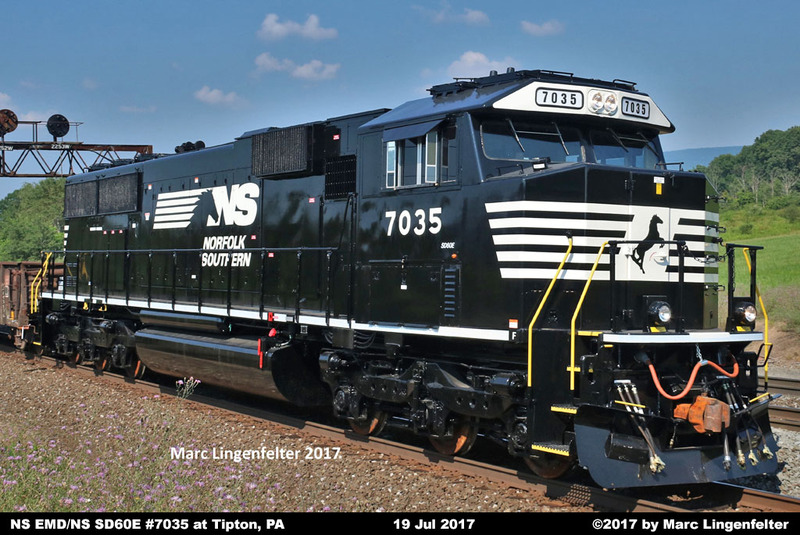 All units are rebuilt from EMD SD60's with new NS-designed "Crescent" wide nose and cab. equipped with the Interstate ECU system from those equipped with the EMDEC ECU system.